Inspired from Ovid, the pastoral masque Acis and Galatea was composed in 1718 when Handel was working for James Brydges, Earl of Carnarvon (later the 1st Duke of Chandos). It was probably first performed at Cannons, Brydges’ country residence near modern-day Edgware. From a dramatic point of view, it is certainly not one of the most fascinating works by Handel. But Handel’s intention was not to create an opera, and nor can this masque be compared too closely with Handel’s operas, oratorios or even some cantatas. Its structure and nature is influenced by the circumstances of its first performance, notably by the small musical band working for Brydges at that time. From the beginning until the chorus ‘Happy we’ the work is mainly a charming pastorale. Then the work plunges into a more tragic prospect with the strongly contrasting chorus ‘Wretched lovers’. While it is unfair towards Handel if we suggest that the first part – with its languid pastoral rejoicing – did not inspire him, the second part relating Acis’s murder by the jealous giant Polyphemus gave him quite a few occasions to develop ideas with his customary dramatic skill. Suzie LeBlanc is occasionally vulnerable in her slowest sustained passages, but she is an absolutely charming Galatea, and her relative vocal fragility does contribute to this perfectly suitable charm. The two tenors produce honourable performances, but are more stylistically erratic than LeBlanc. Their singing technique is not always appropriate, particularly concerning the highest notes, and they occasionally have difficulty staying perfectly in tune. Nathaniel Watson’s Polyphemus calls for few criticisms, even if maybe a darker voice might have been expected. It is worth noting that the effect of the singing is much stronger in the choruses, though sung by the same soloists. This soloist choir offers the most beautiful moments of the recording. ‘Mourn, all ye muses!’ is heard here with very special impact, and ‘Wretched lovers’ is a particularly beautiful example of both descriptive and dramatic counterpoint. 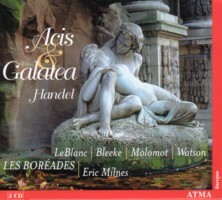 Eric Milnes’ articulated approach is very effective here thanks to the quality of the singing, although the impact of the orchestra is less strong as it is also less accurate. Milnes is responsible for some common musicological inaccuracies. For example, the third tenor is here an alto and his aria is given to Damon, and there are also some unsanctioned additional recorders in some arias. Therefore this is not a perfect recording, but it is a really enjoyable one that offers some marvellous moments rarely heard even in globally better recordings.